My phone alarmed at 5AM and I turned on the TV for the early morning news. I just can't believe the jaw-dropping images that I saw on TV. Raw videos and Live telecast unfolded as the news covered the devastating 9.0 magnitude mega Earthquake in Sendai, Japan. There was one video which was mind blowing and unthinkable that for less than 1 minute, the water swallowed the whole place like miniatures. I snagged this photo from yahoo page and the force of the Tsunami made this possible! Unbelievable! My husband and I just sat in the living room Friday morning with disbelief! 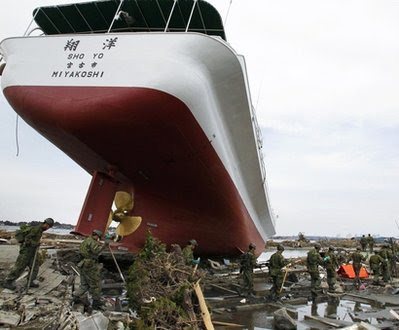 It was heart breaking to see the Japanese in this situation that even though they are well prepared for major earthquake, the nature just strikes with so much force and it's beyond control with engineering. I wonder what will happen next? How will this event impact the economy of Japan? For sure, it will have a great impact to the whole world. I am hoping though that this tragedy will bring people closer to their family and friends. Who knows what tomorrow brings right? I was still asleep when my Hubby woke me up and said, you've got to see this. I was like, what is going on? while clearing my eyes, Ams. Then I watch the news about the earthquake in Japan. It was sad that it happen. Many people died.